When the Cardinal Jorge Mario Bergoglio from Argentina was elected Pope Francis this past week, it was interesting to hear both Catholic and non-Catholic comment about its "meaning." There was hope that a new Pope would "change" some doctrine -- soften the church's stance on gays/lesbians, allow women into the Priesthood, or moderate on abortion. Others made statements as if the Pope would make life easier or better for the millions of the world's Catholics. 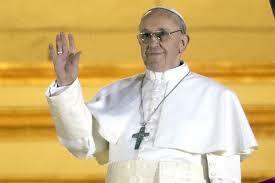 A Cardinal becomes Pope because he understand the doctrine and purpose of the Catholic Church. It is not primarily a social institute that will modernize because of the changing times. The leaders are not political figures that are apt to listen and respond to public sentiment. Thankfully, it does appear that this Pope or other recent Popes have played the populists. The Catholic Church will continue to thrive is its leaders and members abide by its precepts and practice its teachings. In that sense, its leaders will make for a better global society as it emphasizes Christian principles and it members follow suit.